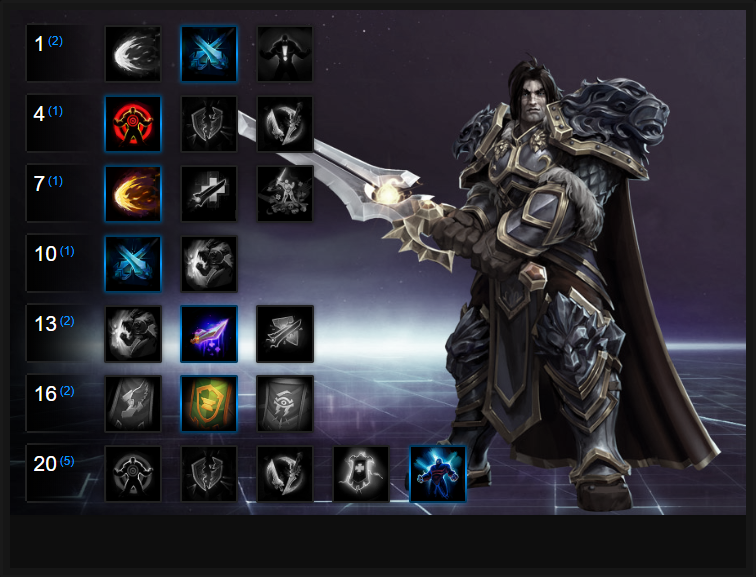 In this Varian Build Guide, we provide an overview of his strengths, abilities, talents and matchups. Varian is unique to Heroes of the Storm in the sense that he can fulfil three roles. He has a base kit which involves a ranged attack (Lion's Fang) a defensive ability (Parry) and an engage (Charge) and up to level ten, is a relatively generic Hero. It's at level 4 however that he can specialize into one of three roles: Tank, Bruiser or Assassin. What's particularly interesting about Varian is that his level 4 talent specialization not only provides his Heoric ability (with the exception of Twin Blades of Fury) but they also provide distinct bonuses and side-effects. For example, were you to choose Taunt you would not only gain the ability to Taunt foes but you also gain 30% extra health and 15% armor. Deciding on what role you want to be at level 10 is incredibly important and will not only define your playstyle going forwards, but the success of your team. Be sure to let your team know which role you're intending to take, whether at the draft screen (ideally) or before level 10. The flexibility of Varian however does dictate that should you need one role over the other - such as if you have too little damage you pursue Twin Blades of Fury - he can do it. No real means of mitigation outside of Parry (no Spell Shield, Block or Unstoppable). His Banner's at level 16 are amazing. Heoric Strike (Trait) - Varian's talent functions similarly to the burst damage ability available to Samuro (Critical Strike). Every 18 seconds, unless lowered by subsequent basic attacks, Varian will deal what's effectively critical damage. Each basic attack reduces the cooldown of Heoric Strike by 2 seconds. You'll effectively need to hit at least 9 times to trigger it twice which, by default, doesn't sound that great. However, if you pursue his assassin Heoric (Twin Blades of Fury) it triggers constantly - the same can't be said for his tank Heoric (Taunt) which dramatically lowers his basic attack speed. Considering you have no control over Heoric Strike and when it will trigger, just look at it as an extra dose of damage. Lion's Fang (Q) - As a skill shot, Lion's Fang has a very thin width. It can hit multiple enemies, but it's also fairly easy to miss them. Its line of travel isn't rapid, but is fast enough that Heroes not on their toes will be caught by it. While its damage isn't eye-watering, it provides reasonable poke and a solid amount of health return, on a not-too-longer cooldown. I would stress however that Lion's Fang is often best used to slow enemies trying to escape, or to prevent enemies from chasing down your squishy team mates. The 35% slow, despite only lasting 1.5 seconds, is often more than enough to create some space. Parry (W) - Parry reduces the damage of all incoming basic attacks by 100% for 1.25 seconds. It's a tiny duration - over in a flash - but is often more than enough to ensure you not only mitigate a sizeable amount of incoming damage. Against a basic attack heavy team you'll gain considerable mileage out of Parry and although it doesn't state it on the tool-tip, it comes with two charges. Just be aware that with a 10 second cooldown per charge, don't waste them. Charge (E) - As your only form of engage, Charge causes Varian to sprint forward and slow the target by 75% for 1 second. It's brief, but more than enough to peel for a team mate, or to secure a kill if an enemy is trying to escape. Although it's not clear on the tool-tip, you can use Charge against players and minions so if you're in lane and need to escape, you can tag one and zip away. Taunt (R) - As the Heroic specific to 'Tanking', Taunt allows Varian to do exactly that - Taunt an enemy Hero to attack him. Its duration, like many of Varian's abilities, is brief. However, Taunting will interrupt any action. If you then combine this with Charge, when talented, you can effectively achieve lock-down a Hero for a sizeable period of time. Alongside obtaining Taunt as a Heoric ability, you also gain 25% additional health (which is outrageous) and 15 armor (15% reduced damage from all sources). Taking Taunt allows you to withstand a considerable amount of punishment and bring some control to the Battleground. Colossus Smash (R) - My preferred Heoric of choice and allowing Varian to fulfil a 'Bruiser' role, Colossus Smash doesn't have harsh penalties (only a 10% reduction to your maximum health). In its place however. you gain a high damage Heoric that deals a little over 160 damage to a single target, while also causing Vulnerability for 3 seconds. In addition to this, your basic attack damage is increased by 100%. That's fairly huge and allows you to hit like a truck (especially after Vulnerability is applied). Always try to land Colossus Smash on high value targets. Twin Blades of Fury (R) - Allowing Varian to effectively become an 'Assassin' - or at least a role somewhat similar to a mix between Illidan and Sonya - Twin Blades of Fury is all about damage. Reducing the cooldown on his trait by 9 seconds per basic attack (WHAT!) and increasing his movement speed by 30% for 2 seconds (per basic attack!) makes him a mobile monster capable of eye--watering damage. On top of this Varian's attack speed is also increased by 100% but his damage reduced by 20%. It's a fair tradeoff and when you combine his attack speed with constant trait triggers, it soon makes up for the damage shortfall. Overpower provides some control over your ability to trigger your Trait. When you successfully Parry an attack, it will reset your Trait. This then allows you to lead back with a basic for high damage. Even if you don't follow up with a basic attack, you have your Trait primed and ready for when you do. Variable: High King's Quest is a great talent because it boosts your basic attack significantly over the course of the Quest. With three lines to the quest (50 basic attacks, 5 Hero takedowns, 20 Health Globes) each successfully completed gives +10 base attack damage (+30 for all three completed). Upon completing them all however, you also gain an additional +30 base attack damage (+60 total). It's a huge amount but doesn't provide the spike return of Overpower. If you're seeking pure lock down, take Taunt. It's incredibly annoying to fight against when combined with Shield Wall as you have so much mitigation thanks to your Parry's and your armor (+15% mitigation). Not only that, but Taunt allows to regularly interrupt and lock-down a single target for your team to kill. The health boost is also a bonus. Variable: often the Bruiser role for Varian because his combination of Charge > Colossus Smash > Lion's Fang can offer huge burst for him and his team. He might not be as tanky as if he were to take Taunt, or deal as high damage as Fury, but it ensures he can - at the very least - deal massive damage instantly. Lion Heart is a brilliant talent if you're intending to take Taunt and pursue a "tanky" build. Increasing the health return of Lion's Fang's healing from Heroes by 50% is huge, and ensures if you hit multiple at once that you gain massive sustain. Variable: Second Wind is poor if you're intending to Tank and take Taunt, but if you're pursuing Colossus Smash and Twin Blades of the Fury the health return is fantastic. 1.17% of your basic damage returned as health isn't amazing, but when under 50% health 50% of your damage is converted. It's a huge amount that offers incredible lane sustain. Against ability heavy teams who have Heroes such as Li-Ming, Jaina or Gul'dan, Shield Wall is amazing. Parry negates ALL incoming damage for 1.25 seconds. Although you lose 1 charge of Parry taking Shield Wall, you do lower its cooldown by 5 seconds. A fair tradeoff. Tying into the fact you'll be hitting players in the face with Colosuss Smash, Mortal Strike reduces the healing they take by 40% for 4 seconds. Combined with the Vulnerability they'll suffer, it's an invitation to blow up an opposing player near instantly. Variable: Juggernaut is a great alternative if you've taken Taunt or Twin Blades of Fury. It allows you to deal damage equal to 4% of a Heroes maximum health. Against double tank compositions, high health Heroes or if you've taken Warbringer (level 4 talent) it's amazing for additional burst. Variable: If against Heroes such as Tassadar, Zarya or Artanis, pickup Shattering Throw. Its passive allows you to deal 200% bonus damage to shields (WHAT!) and its active a huge burst to a shield and health pool. It effectively deletes any Hero who relies on shielding from the game. Probably the most valuable, irrespective of which Heoric you choose, Banner of Ironforge reduces the damage you and all allies take by 20% for 12 seconds. It's an enormous amount of damage mitigation and as long as you place it at the back of a team fight (so it doesn't get killed quickly) will ensure your team and you can survive so much longer. Variable: Banner of Stormwind is a good alternative. If your team lacks mobility, gaining 25% increased movement speed for 12 seconds while in its radius provides an unrivalled means of engaging or retreating. Demoralizing Shout is great irrespective of which Heoric you've chosen. Reducing the damage you and your entire team take by 40% for 5 seconds is incredible and as far as I can tell, pairs with Banner of the Ironforge. Variable: Vigilence allows Varian to reduce the cooldown on Taunt by 1 second every time he's struck by a basic attack. Considering he's often in the middle of a team fight and when combined with Parry, it allows Taunt to be constantly available if the enemy team choose to attack him. These Hero Threat Levels (1 being lowest threat and 10 being highest threat) are to help you determine which enemy Heroes can give you a headache. For the Heroes listed here, take extra care as they're particularly dangerous for Varian. Lunara: Her mobility, nuisance poison and vision make her a challenge for Varian. You can engage her, but she'll quickly evade and continue to harrass. Tracer: She's super fast and can Blink away from you. You've really no means of keeping her pinned and your Taunt (were you to take it) lasts too little time. Thrall: His root, ranged poke and self healing are very difficult to deal with. If he uses Earthquake you'll struggle to disengage and he'll happily cut through your health. The Butcher: He has proved a nightmare to play against as Varian as your lack of Unstoppable and damage mitigation (outside of a talented Parry) see him deal massive damage. If he has Hitching Post, you're seriously in trouble. Illidan: Evade, self healing, mobility, damage - he's a headache you just can't get rid of and your Parry won't save you. Greymane: He has the burst potential to kill you incredibly quickly. His burst is huge and his poke not too shabby. This list of tips and tricks are just a handful of things we think will help your Varian play. We'll continue to add to the list as required and if you have any tips you'd like to share, let us know in the comments below and we'll place them here. 2. Remember that you have no reliable means to disengage. You can't always target minions with Charge so don't over-extend and stay near your team. 3. Unless you take Overpower, you can't really control your Trait. Don't worry about it - just treat it as extra damage. 4. Taunt can interrupt every single heroic abilty. The only one it can't is E.T.C's Mosh Pit - the only way you can disrupt this is if you catch him the moment you hear his music, or if a team mate casts Unstoppable on you before drawing him out. 5. Variables (as noted above) are important for Varian based on the build you pick. Whether Tank, Brusier or Assassin you should be making minor tweaks here and there. 6. Always try to have your team focus targets affected by Colossus Smash - especially with Mortal Strike. Unless they've a huge amount of escapes and/or get granted Unstoppable, they should die very quickly. 7. It's best to save Lion's Fang for enemies attacking your team, rather than using it to poke. The slow will help allies escape. 8. Even if you pursue a Tank based build, Varian only has Parry and his high health pool (thanks to Taunt) to withstand punishment. Heroes such as Johanna have direct methods of mitigation (shielding, unstoppable, spell shield). Don't face-tank just because you think you have lots of health. 9. If you're pursuing an assassin build, you aren't indestructable and remember you have poor mobility. You've some good sustain from self healing and your attack speed, but you're still no match for Heroes such as The Butcher, Illidan or Thrall - all of which have better sustain. 10. Try to always ensure that you place your Banner in a location where it won't easily be killed. There's no use placing it down in the middle of a team fight as it'll die instantly. Their radius is large so don't be afraid to place them in a somewhat concealed spot. 11. Twin Blades of Fury provides enormous damage and sustain and allows Varian to solo any boss in the game comfortably, in less than 30 seconds. 12. Varian works incredibly well with Abathur. If you can encourage your team to take him, with a Symbiote/Carapace build, you'll wreck face (if Fury specced).